My mom, being the wonderful teacher that she is, tended to get toys for us that had an educational flavor. 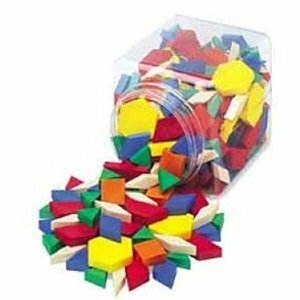 One such toy that was a favorite of mine, was a bucket of plastic, geometric shapes. Sitting by itself it didn’t look like much, a bunch of squares and diamonds and hexagons all jumbled together in a clear plastic bucket. However, the magic began when you dumped the bucket out and mom handed you the double-sided, pattern cards. On these cards were all sorts of cool pictures; like flowers, trains and buildings. The cards (on the easy side) had an outline showing how you could take each plastic shape and put them together to make the picture (the hard side had the picture minus the outline). As the scripture was read I thought back to that childhood toy. The image of a mini-me sitting in the den, dumping out the bucket and searching through to find the exact piece that I needed, and excitedly placing it in the exact spot it had to go to make the picture work, came to mind. Then another memory flashed, it was one of me frantically searching all around to find my missing pieces that I had not been careful with. I remember the frustration when I would take my picture apart and have to start all over on something else just because one piece was not there. I think that this is kind of like the unity of the church. Each member is a unique geometric shape, placed in that “bucket” (church) by God. They are all designed to fit perfectly into a pattern that He has created. Some of us are diamonds, some triangles and still others are trapezoids. I was quick to realize, as a kid, that it didn’t matter which piece was missing–it could be a leaf or the center of the flower–if even one was not in its place, then the entire picture was messed up and I had to choose another pattern. In the same way every member of the church is extremely important–whether you are the much-needed nursery worker, or the preacher himself–God’s plan for the church cannot work if even one of its member are missing or not doing their part. Even though we may not be able to see how everything fits together, our Father has a pattern card and on it a beautiful picture awaits to be made.